Let’s talk fall for a minute. Acorn squash. On the outside, it may be dark green, orange, or beige. The ones with dark green skin seem to be more common at our local grocery stores, although Trader Joe’s had some pretty orange ones last fall. I find acorn squash easier to work with than the other amber-fleshed winter favorite, butternut squash, so we eat it often around here. Using a large, sharp knife, slice the squash in half lengthwise. Scoop out the seeds and strings and discard (or you can save the seeds for roasting). Place the squash halves, flesh side down, on the lined baking sheet. Roast in the oven for 30-40 minutes, or until flesh is soft. 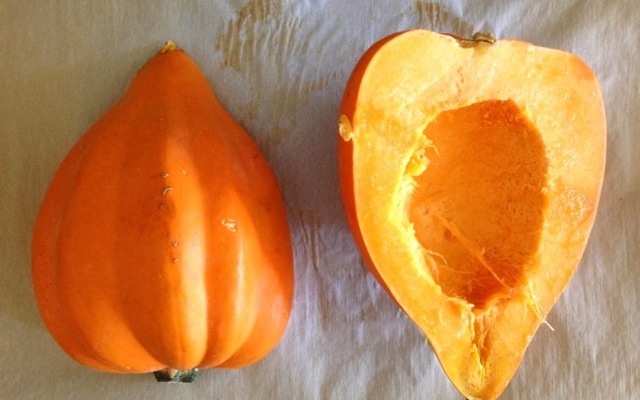 Using a potholder, flip the squash over so the flesh side is facing up. Place 1/2 tablespoon butter in the cavity of each half. As the butter melts, spread it around with a spoon. Sprinkle each half with 1/8 teaspoon cinnamon, 1/2 tablespoon sugar, and a pinch of salt. Serve immediately. For serving, you can simply scoop out the flesh with a spoon and place on individual plates. Or you can slice each half down the middle and serve each person a wedge. Yum yum yum!! this is how our mother taught us to bake it, also adding about 1″ of water to pan before baking.. we love it and have it often.its my husbands first experience of liking it! ( my sisters and I met you at your home in Austin while at sister Susan’s daughter Wendys house!) Thank you for your cookbooks!